Topiary plants and trees can be used to add sculptural impact to garden or can be planted as garden feature. 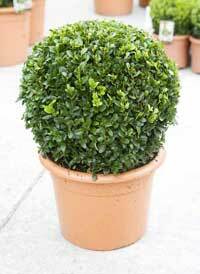 Topiary plants and trees will enhance any patio, balcony or terrace. On our website will find best garden plants for formal, modern or roof garden. 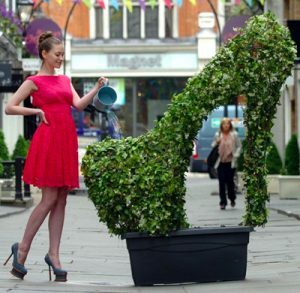 Topiary can be used in different garden styles and create interesting design effects. Railton is a short drive from Devonport via Latrobe, a part of Tasmania’s “Outdoor Art Gallery” – and here you will find Tasmania’s hidden secret – more than 100 living sculptures of character topiary waiting to be discovered. The wonderful thing about Railton’s topiary is that it is a free activity – and interesting to all ages! It costs you nothing but your time to stroll around the topiary exhibits – you can’t say that everywhere you go! It is a fantastic project and you will see topiary in all stages of growth along the topiary trail. Recently The Apex Club of Latrobe funded the production of the ad with funds raised through the Apex Railtown Expo held at Devonport showgrounds in February. The ongoing airing of the ad is a joint funding project of all the groups (Businesses & Topiary Group, RADDAi, and Apex Club of Latrobe). It is envisaged that the ad will be aired for a month a time, and will be on for a full 4 months of the year on Southern Cross. Print the topiary trail map from this site – free topiary trail maps are also available at shops in town and have been developed by the Topiary Group with tremendous support from local business. The whole promotional information package that is developing to promote Railton’s topiary including the television advertising campaign is a terrific achievement for these community groups working in cooperation. Not many towns have the opportunity to promote their attractions with television advertising and this is a terrific achievement for the small historic town of Railton which has been bypassed by major roads over the years. A Yorkshire estate has been showing off some top class topiary on its nearby green this week. Shaun the topiary sheep and his floral display have been causing quite a stir on the estate’s Kirkfield Green thanks to Thorner Tenants and Residents Association. Association member Andrea Walker said: “Shaun has taken up residence with us for the summer season and has already given lots of pleasure to many people living in and out of the village. “Shaun’s visit is part of the association’s green team’s flowerbed project aimed at giving the estate the uplift it was in need of. “As members of Thorner Tenants and Residents Association we feel very honoured to be the first people to show Shaun off in a rural setting. Leeds City Council (Redhall Nurseries) has let the estate display Shaun on loan this summer. But it is Thorner Tenants and Residents Association, established in October last year, who has successfully secured his debut appearance for the benefit of the village. Mrs Walker said: “Our aims and objectives are to make our environment a pleasant place to live and to improve conditions to promote and represent all tenants and residents of the area. We have planters arriving in the near future which will be placed on the Bramham Road area to provide a floral display and the association has also helped elderly residents and just recently provided skips around the area. l The association is holding an open meeting on the July 25 at Thorner Primary School at 3.30pm until 5.30 pm. Representatives from the local police, fire service, highways and East North East Homes Leeds departments will be present to deal with any issues along with members of the association committee. St Christopher’s Place just a stones throw away from the hustle and bustle of Oxford Street – Monique Cockerill poses with the giant Lady Gaga shoe created from flowers. The shoe was made to launch a week long event of floral and fashion themed festivities this bank holiday weekend. Lady Gaga bought a pair of these denim shoes from Lungta de Fancy in St Christopher’s Place. 26/05/11 Anne-Marie Sanderson. 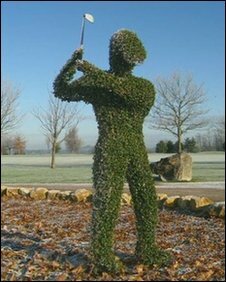 A 6ft tall topiary bush in the shape of a golfer about to hit a ball has been dug up and stolen from a golf club in East Sussex. It had been imported from Italy and had only been in place at the Sweetwoods Park club, in Holtye, for six weeks. The unique work of art was stolen overnight between 9 and 10 January. Police believe several people would have been needed to dig up the bush, and lift it over the perimeter fence of the golf club. Neil Crittenden, the head green keeper, said the topiary, which is worth about £1,000, had been planted into a container which was dug into the ground at the entrance to the club. “All the members loved it and it was a nice piece. It’s sad to see it go,” he said, adding that a reward was on offer for its safe return. The hedge outside his kitchen window had grown wild when the 49-year-old took it to task. With a hedge-trimmer, shears and even a pair of scissors he carefully carved out seven adult elephants and three babies. And the unique topiary hedge has become a tourist attraction outside his home in Brecon. Mr Hogg, 49, fell in love with the wildlife during a safari in Kenya that when he returned home he decided to recreate a little bit of Africa in his back garden. It took two days to craft the herd and the result is a striking 100ft-long trail of green elephants that stretches around the corner of his family home outside Brecon in Mid Wales. 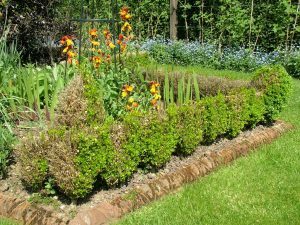 Mr Hogg said: “It was just a normal, fairly boring box hedge when I started. I found a picture of a group of elephants and set about shaping it. Time seemed to disappear while I was working on it. “I was able to create the appearance of folds in the skin and shadow lines for shoulder blades and hips. Mr Hogg and his wife Vina, who have two children, farm organic vegetables at their 17th century home.